Admin script completely menu driven! Features : Kick,ban - with reasons, slay changeteam, voting, server management, bot management, script management. admin restriction via admin flags - simular to mani! In Suicide Barrels there are 2 teams, Barrels and Humans. The object of the game for the humans is to kill the barrels, the object of the barrels is to suicide bomb the humans. Allows you to have special settings for a map or maptype. 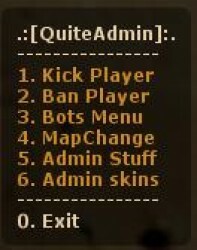 Provides an easy to use menu for admins to change the map. 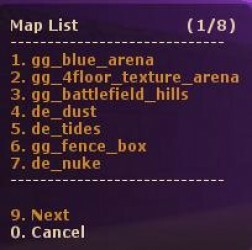 Changes the map a set of popular maps when no one is on the server.